Last week I featured a woman who was a member of the first generation of Japanese women admitted into art schools, the coveted guild of ceramic artists in particular. I featured a Japanese woman artist who bucked the guild system, but unfortunately, such examples are few and far between. That being said, the acceptance of women artists in the West is equally as dismal, although I still maintain that public recognition does not mean that women artists have not always been an important contribution in art history, and that goes for both East and West. The women associated with the Impressionists were no less ground breaking than any other period. Eva Gonzalès was part of the first generation of women artists who displayed their work as art-for-art’s-sake, rather that adhering strictly to academic guidelines. Although she showed almost exclusively in the French Academy, her work breaks with past traditions of subject matter and style. 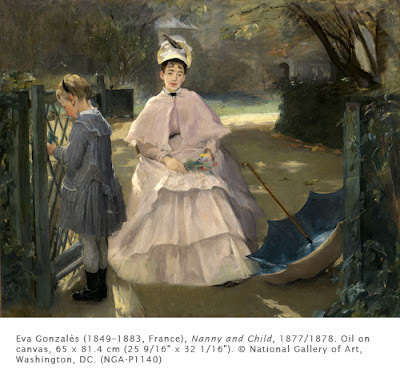 Along with Mary Cassatt (1844–1926) and Berthe Morisot (1841–1895), Gonzalès was the only other woman of any stature associated with the French impressionists. Although her style is identified with the impressionists, she never exhibited in their independent shows, although she was invited. Like Édouard Manet (1832–1883), Gonzalès preferred to achieve personal success in the official Salon, rather than in the independent exhibits. Gonzalès was the daughter of a celebrated Parisian novelist, who introduced her to avant-garde literary and artistic circles when she was a child. This exposed her to the latest ideas in the art world at an early age. At the age of sixteen she became the student of academic master Charles Chaplin (1825–1891), whose style was basically realism. 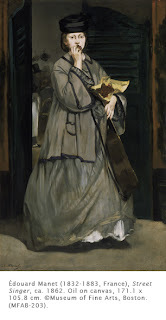 The major impact on her career, however, was her meeting and eventual friendship with Manet in 1869. The relationship evolved into a warm master-pupil type. Gonzalès’ first entry into the Salon in 1870 was highly praised, not only for the sensitivity of the work, “The Little Soldier,” but also because she was only twenty-one. Already with that work, Gonzalès showed the influence of Manet’s painting from the early 1860s, a period when he was influenced strongly by Spanish Baroque painting. Gonzalès showed works every year after that, but she never achieved the professional success of Morisot of Cassatt. Her painting style changed little through the years. Nanny and Child is typical of her style, and strongly evocative of Manet. Formal characteristics such as the somber, muted palette; limited middle tones; and fluid brush were elements of Manet’s work that appear in Gonzalès’. Silhouetting the light figure against a dark background recalls Manet’s single figure paintings from the period of 1861 to 1866. Her subject, like most of the impressionists, was chosen from every day life. Unlike the impressionists, her palette reflects her academic training with Chaplin. After 1871 Manet chose to work in the more brilliant palette of the impressionists, but Gonzalès did not follow his lead. She continued to use her muted palette because she felt it suited her temperament. Her works, painted with the same sense of detachment as Manet’s early figure works, continued to reflect a sensitivity and sincerity until her early death in 1883. Activity: Portrait with light and shadow. Using heavy textured colored construction paper (suggested colors: beige, black, orange, gray, or green), draw a portrait or figure of a person in dramatic darks and lights. Use chalk, charcoal, or white or black colored pencil to achieve dramatic contrasts in light and dark.